Ontdek Kenya's educational tours aim to give the teacher/s accompanying the students the necessary support to make the tour a success. - Ontdek Kenya's educational tours are not just about price quotations. We will consult with you to ensure that we come up with a student travel experience to Africa that is educational, mentally stimulating to your students, have soft activities and exposes your students to a new way of thinking. Of course wildlife viewing is important and we ensure that there are a lot of opportunities for it but we delve further than just the animal sightings and learn about animal behavior, territorial habits etc. - Our eduactional-travel services are about stress free school trips. We give you value-adding ground information that would any day beat a guide book as we know what is the most up to date info of a location. When you land in Kenya we execute flawless ground logistics in transport arrangement, accommodation, entrance to all activity areas and those crucial behind-the-scene arrangements that make your students have a great time. - The measure of a good educational tour is not in the number of parks visited but the time devoted to quality learning experience in each place. You can count on our experience on park selection and combination to come up with a relaxed but detailed itinerary that has minimal transfers ensuring that your students have enough time for the educational opportunities that are available in the itinerary. We encourage you to stay in one location for a min of 2-3 nights. - We are proud of our educational safari staff who are accomplished naturalists with many years of experience in safari. They will be worth companions to you and your students and they will not only help in animal, birds and plants identification but also in interpretation of animal behavior. Count on them to provide information about the Kenyan culture, politics, religions, conservation and all aspects that make this country tick. - We can include social programs like school visits where your students will see how the Kenyan school system works as well interact with students. It is also possible to arrange that your students participate on a project for example planting trees, painting class rooms etc. 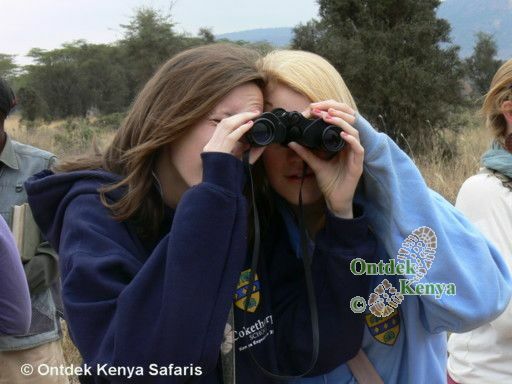 For a consultation on high school trips to Africa contact Ontdek Kenya Safaris. How to choose the right student travel agency for your school tours. See sample itineraries of Ontdek Kenya students travel to Kenya.